– You still have a few days to go for the start of the next calendar year – 2011. Do you wish to gift a free calendar to your friends and loved ones? If yes, here you go. 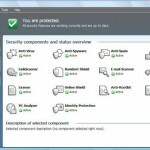 How to make an yearly calendar for 2011? Last year we showed an easy way to create free printable photo calendars for 2010. While you can still create a similar personalized yearly calendar for 2011, here we tell you about another easy free method to make your own printable monthly calendar and download it as a PDF to print. 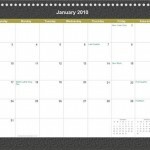 Take a look at this article on making a free calendar 2010.You can follow the same steps to create a quick free yearly calendar for 2011, with your own photos, and download it. How to make a 2011 monthly Calendar? 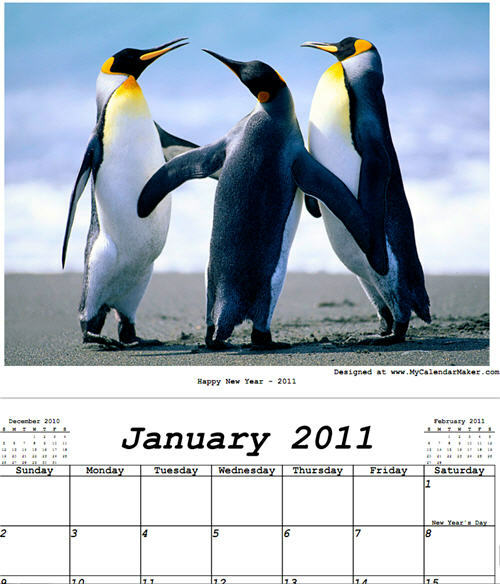 Here is how you can create a monthly calendar for 2011 and download it as a PDF document for free! You can then print it to any paper you like. 1. 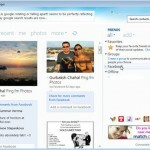 Go to mycalendarmaker.com and create a free account. After creating an account, you can start creating a new calendar by clicking the “Start New Calendar” link at the bottom of your account page. 2. The next step in designing your own personalized custom photo calendar is choosing your preferred calendar type. 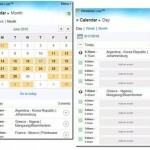 This free online calendar maker offers you three calendar types to choose from. Full-size – Full-size calendars have the picture and the month on separate facing pages (horizontal alignment). Half-size – Half-size calendars have the picture and the month on the same page (vertical alignment). Tear-off – Tear-off calendars have one picture and 12 months. Each month is on a separate sheet facing the picture (horizontal alignment). 3. After choosing the desired calendar type, click the “Submit” button at the bottom of the page.The next step is choosing the calendar length i.e. you will have to choose the start and end months for your calendar. To make the order process go as quickly and easily as possible, have all your pictures (for the various months) and the cover page readily saved on your computer in JPG format. Also, have a list of your personalized dates in chronological order readily available – These could be holidays and/or any other important dates in your family. The option to mark family events is where I find this calendar to be really cool. It is not just the holidays, but you can mark all the important birthdays and any other family events on this customizable calendar. 4. After choosing the start and end months for your calendar, click “Submit”. You will then be presented a calendar grid where you can upload the images for the calendar. If you had chosen multiple months, you can upload one image per month and specify the important events and/or holidays against the various days of the month. You can also optionally specify a caption of max. 100 characters. While Premium members can specify a clip-art and 2 lines of text per date, free members can only specify four events of max. 15 characters per date. After you are done editing for a month, click “Next” to upload an image and specify the events for the subsequent months.After you are done editing the calendar for all the months, click “cover Page” to specify an image for the cover page. 5. Finally, click on Generate calendar to generate a beautiful calendar for 2011 and download it to your computer as a PDF file.You can then print this PDF file using a color printer and appropriate sheets, to generate a beautiful personalized calendar 2011! We have created a simple personalized photo calendar for just one month – Jan 2011 and the above partial snapshot shows how the finished product will look with your own photos.Note that we had chosen “Full-size” as the calendar type and marked very few events, which are not visible in the snapshot, for generating the above sample calendar. If you like the idea, get started in making your own free printable monthly calendar 2011!